Smoke chats to the illustrator about his work, what inspires him, and his brilliant Waterfront covers. As far back as I can remember, I’ve always wanted to pursue creative outlets and I ended up sticking with that approach until I wound up with a career as a freelance illustrator. I’m always drawn to cinema as a source of inspiration as it tends to be an exciting marriage of sight and sound, which acts as a great source of stimulus to channel into the personal work I make. After studying a degree in illustration, I ended up working part-time whilst continuing to produce a portfolio of work. The real leap came when I took the plunge and quit my job to focus on freelance design work full-time, taking on any creative opportunity that I could get my hands on. 3. How did you find your style? Has it changed since you started? I’ve always been torn between the clinical bold style of graphic design and the more analogue approach to illustration. So the sensibilities of my work haven’t changed that drastically over the years, but as I’ve continued to experiment with different tools and mediums the visual approach has developed into something quite different than when I began. 4. What was it about illustration that opened up a career path for you? When I was starting out I found that illustration was a good compromise between graphic design, traditional art and photography, and this multidisciplinary approach kept things really exciting for me. It boiled down to the simple idea that I enjoyed making images and was prepared to invest the time into making it my living. Editorial illustration is also a great gateway into the industry because the work is usually low risk and allows art directors the freedom to take a punt on a young artist to give them real world experience in the early stages of their career. 5. What would you be doing if you had not chosen art? Probably architecture, or some creative role within the film industry. Directors - Paul Thomas Anderson, Denis Villeneuve, Steve McQueen, Damien Chazelle, Alejandro González Iñárritu. Image makers - Eyvind Earle, Moebius, Fumio Watanabe and Saul Bass. 7. What does your workstation consist of and what are the tools of your trade? I conceive most ideas quickly in a notebook, and then use a combination of a Wacom graphics tablet, Mac computer, and scanned textures to produce the majority of work. Usually with a coffee to hand. 8. 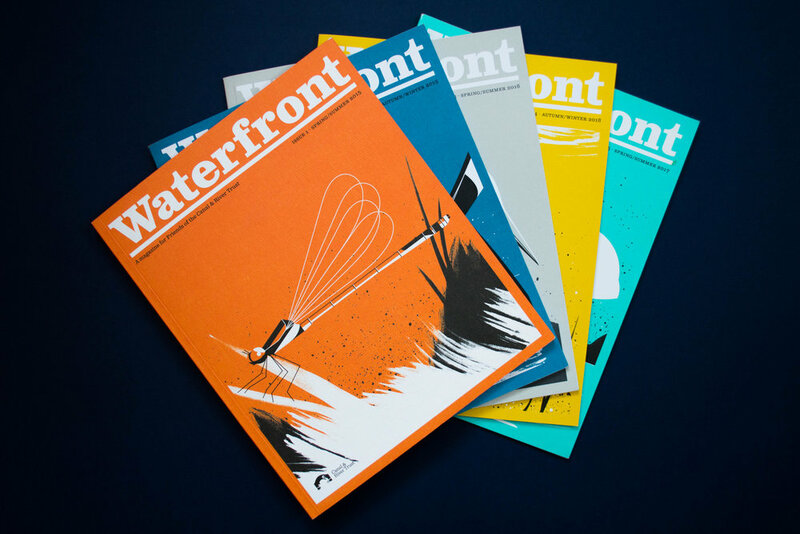 What was it about the project with SMOKE to create the Waterfront magazine covers that appealed to you? From the outset, the project sounded really exciting. The creative vision from Paul Pensom (Waterfront's Art Director) to produce a series of covers with a house style, which aimed to define the identity of the magazine was very appealing to me. The level of trust given to me from the team also means that it is consistently something I look forward to working on at the soonest possible opportunity. 9. How did you come up with the idea for the front cover of issue 1? In the beginning Paul and myself worked to define the style of the first cover. The idea was anchored around the concept that each issue would depict one creature from the British waterways in their natural habitat, to be chosen by the Canal & River Trust, with the first being a Red Damselfly. Along with the limited colour palette, the image itself needed to be bold and modern whilst retaining a sense of tradition, so I suggested a graphic approach to the animal paired with some softer analogue elements to breathe some life into the scene. "The idea was anchored around the concept that each issue would depict one creature from the British waterways in their natural habitat"
10. We’ve seen that you’ve designed a very unique cover theme for Waterfront. Can you tell us about what inspired them and when are we likely to see issue 6? We drew on inspiration from the periodicals of the 40’s and 50’s such as the John Hanna illustrated ‘Country Fair’ magazines or the ‘Men Only’ illustrated covers of the same period. This allowed us to retain the nostalgic qualities requested in the brief through a similar use of colour and subject matter whilst defining a consistent modern identity with the use of crisp vector art. The creature of the next issue will be tricky to catch unless you have a net handy… It’s due out November 20th. 11. Are there any big projects you are currently working on that we should look out for? I’ve recently been working on some large-scale projects for a couple of drinks companies which I’m excited to share in the near future. For the time being, I’m going to be visiting Japan for a few weeks and am planning on using that as a springboard for a larger research project in the lead up to the new year.